Self Catering Cottages and Accommodation Located in County Down Northern Ireland. Excellent travel routes to Belfast and Dublin. Northern Ireland Tourist Board 4 Star approved Golfkeel Cottages in Banbridge, County Down are ideal for the business and holiday traveller alike providing the perfect self catering accommodation in Ireland. Purpose built, all three of our detached holiday cottages are circa 1,800 square feet over two storeys and are set in their own private grounds with gardens. There is secure on-site parking for up to 6 cars. 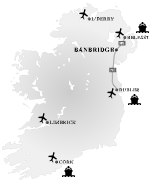 Our luxury self catering cottages have a central location just off the main Dublin - Belfast road (A1). Located just one mile from the centre of Banbridge Town enjoy the tranquil and peaceful surroundings with panoramic views of the rolling countryside and the Mountains of Mourne. Enjoy a relaxing holiday break in Ireland where you can unwind, while still only twenty five minutes drive from the bustling city of Belfast. All of our holiday rental cottages are family friendly, boast family sized self catering accommodation with all our bedrooms ensuite and all with patio and barbecue areas. With the exception of The Loft Cottage all of our other cottages including the Dovedale Cottage and Oatfield Cottage are wheelchair friendly with Category 1 Status in the National Accessible Scheme for wheelchair users and others with mobility problems. Golfkeel Cottages are managed by John and Oonagh O'Neill. Whatever your interest, Golfkeel Cottages and its surrounding areas has the right sporting or recreational activity for you. Visitors will be able to enjoy their favourite leisure pursuits including Angling, Cycling, Dining Out, Golfing, Horse Riding, Shopping plus much more! Did you know you can stay at our luxury self catering cottages in Ireland from as little as £300? For this you can enjoy either a 3 day mid week break or weekend getaway with your loved one, family or friends. 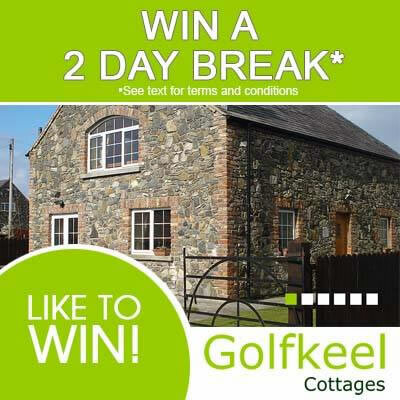 Are you looking to stay at Golfkeel Cottages for a week or more? Our spacious accommodation is also available to book for week long breaks or if required a longer term basis. Our weekly rates start from as little as £425 per week. Alternatively you can Book Online Now!